You want GREAT PERSONALITY in your Devon kitten/cat Most of ALL. I just wanted you to know that we picked up the kitten last night and love him to death already! He is such a charmer and good natured cat. I just e-mailed BJ about our learning experiences with litter boxes and the "reach" of a cat. Nothing is out of their reach! Jeff, the girls and I are learning, sometimes slowly, but we're learning. We couldn't have asked for a better cat. He's already relating to all of us, including our dog. That relationship will take a bit to nurture, but we're letting that happen naturally. This morning he spent on my daughter's lap, curled up and sleeping. My daughter was in heaven. Waiting 4 years really paid off for her. The girls named him "Spot". There was no talking them out of it, so it will be Spot! Thanks again for all the information and contacts. 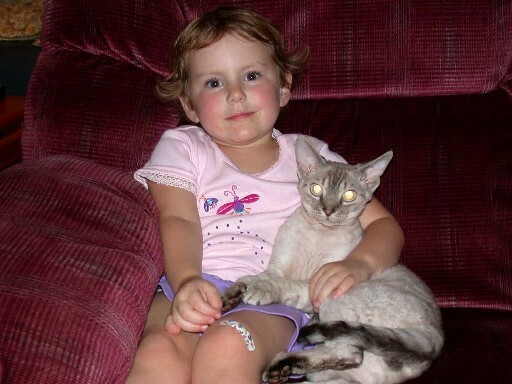 The Devon Rex is a wonderful breed and I can tell that just from one night with the little guy! Thanks from the entire Ruedinger Family! Maybe I'll write a book about him someday???? I just cant believe how much we love Thumper. And he thinks he is a special half humanhalf cat. He has to drink out of a glass, and he lets you know when it needs to be tilted more. Its hard to explain. He gets me up in the middle of the night when the other kitties are hungry. He sleeps under the covers with me. He knows everything that goes on in this house and immediately identifies anything new. Plus hes our watch cat. Hes truly amazing! Hes simply gifted and is so loving with the little throwaways we find. Although this last one started to nurse him and he didnt really go for that. Sheila, I still cant thank you enough for bringing him into our lives. Anyway, I bet you hear these stories from everyone and they are probably all the same. Mushy stories about how their baby is the smartest, cutest, bravest, etc., the only difference with ours is, is that Thumper really is all those things and more! His hearing loss is not a disability for him, its an advantage for him and he takes full advantage of it! Oh, to only sleep like he does!! Ask for REFERENCES from past buyers EXample: Have People come Back for another kitten from the same Seller??? have finally decided on the name Snickers. Will the Breeder let you come and see their cattery? All the cats? Are all the eyes clear and bright with no discharge in them? Mom and Dad to your kitten? Do they have their papers? Shot records? Will they give you a pedigree if you want? Mostly, just get to know the Breeder of the kitten you pick and let them get to know you so that they can place a kitten to your needs. Hip dysplasia in Devons is rare. Genetic heart problems are slightly more common. From slight heart murmers (they outgrow these usually) to Cardio Myopathy (which is a very serious problem). The Devon Breed is fortunate to have very good health over all and Good Breeders have their Vets do a thorough Check on their kittens when they take them in to be Neutered/spayed for murmurs or other problems. This one is a sucess story even though her post was sad. "A beautiful little black Devon. She passed away last week some time during the night of August 24th. I found her in the morning, lying on her blankets. She was 14 1/2 years old. My life will not be the same without her, she meant the world to me." Thank Goodness there are more stories like this one. At 14 1/2 years old, it is hard to lose her, but the trip through her life, I am sure was well worth it for this Buyer. Most Devon Breeders want you to have a wonderful Devon, whether it is from their cattery or not. If they do not have what you want, or just do not have kittens available, they will help you look for one by giving you e-mail or telephone numbers of other Breeders that they know and trust. **Be careful with this though, as some Breeders will not recommend others because of their own agendas. Ask them to tell you if they have seen the cattery recently and can you have the name of dissatisfied customers.